Well it is back. One of our favorite festivals of the year. Kampai Toronto. Celebrating its 6th, all 5 of which In Your Mouth Toronto has attended, this year we of course will be in attendance and you should as well. You get access to some of the best food in the city and of course a colossal selection of sakes, many of which cannot be found in Canada. You should know that this festival is very important to the Japanese sake breweries, enough for them to send company owners, delegates, Tojis (sake brewmasters) and media from all over. They come for the festival but also to host unmissable intimate sake pairing dinners at restaurants all over the city. Don’t miss them or the festival. Kampai Toronto is the largest sake tasting event in Canada, with sold out crowds for the last 5 years. The over 850 attendees includes sake brewers, restaurateurs, industry experts, media, and general sake enthusiasts. Attendees have the opportunity to meet brewers, learn about sake, and taste a wide selection of sake, often not easily accessible to the general public. 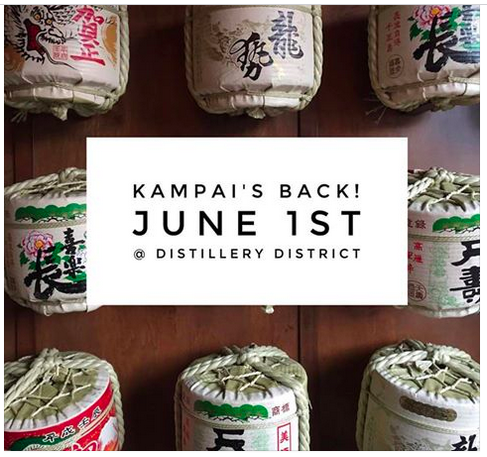 Kampai Toronto is a cultural, food, and sake festival showcasing sake from over 40 breweries from Japan and around the world, featuring over 150 sakes with many brewers flying in from Japan for this special event. Along with sake, the festival also showcases a selection of tasting items from Toronto’s top local Japanese and contemporary restaurant partners.